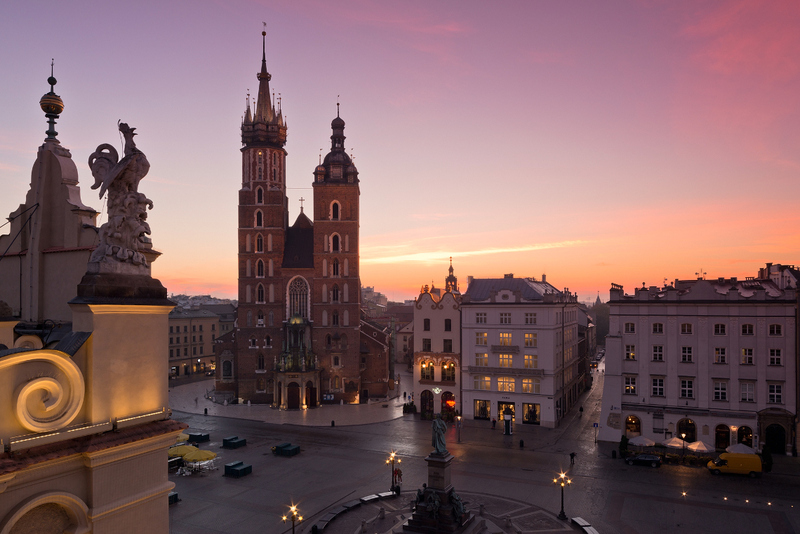 Kraków is a city of approximately one million people in the very heart of Europe. Being Poland's former capital, the cradle and pantheon of Polish kings, it is also a city of learning with one of the oldest universities in Europe. Kraków is a city of both museums and youth: a city of one hundred fifty thousand university students. It is a city of meetings, festivals and conferences. The city of cafés and restaurants that enchant all those who even for a moment set foot in its old town. The city has eluded destruction since the Tatar raid of 1241. Thus, Kraków has preserved its original body of structure and buildings. The functionality of its thirteenth-century urban plan is proven by the fact that it still works today! Cultural, administrative and commercial life is focused around Kraków's 40 000 square-meter town square, the largest one in Europe. More information about the city, current cultural activities and a list of some interesting places to see in the city and near Kraków can be found in my KRK mobile application The myKRK guide to Krakow includes few sections: practical information, visit Krakow, calendar of events, municipal transport, news, map of Krakow. The application is available in English. The gothic church dedicated to the Assumption of the Virgin Mary, is the most significant monument in the area of Market Square. I was built in the 14th century. The most remarkable object in the church is the world’s greatest wooden altar by Wit Stwosz. St Mary’s church is also well known for its trumpet-call, played every hour from the top of the main spire.The official website with visitor information can be found here: mariacki.com. The center of the city, its soul, is Rynek (the Main Market Square) - one of the largest medieval squares in Europe. It is included on the UNESCO list of World Heritage Sites. It is not only the old medieval center of the town, surrounded by museums, galleries and unique beautiful buildings. It is also lively with street artists, cafes, restaurants and clubs. Situated at the heart of the Main Market Square, this renaissance building is one of the city’s most recognizable structures. During its golden age in the 15th century, Sukiennice was a major centre of international trade. That history of trade is still evidenced by the main hall that runs through the building where you can buy great souvenirs, including Kraków’s famous amber jewelry. Don’t miss the underground museum, which reveals Kraków’s past in a state-of-the-art multimedia exhibit. You’ll experience medieval life in Kraków's Old Town and the significance it has for the city today. This district was the centre of Jewish cultural life in Kraków for over 500 years before being destroyed during World War II. It is a popular pilgrimage site, which has led to the return of contemporary Jewish culture in the area. The former Jewish square, now known as Plac Nowy, is the natural centre of the district and a great place to start exploring. Kazimierz is also known for great restaurants and a unique night life. The Schindler's Factory Museum is a popular tour (mhk.pl/branches/oskar-schindlers-factory). You may notice that Steven Spielberg's movie, Schindler's List, was shot in 1993 almost entirely in Kazimierz. Built in the 13th century, the Wieliczka Salt Mine is one of the world’s oldest salt mines still in operation. Now a museum that attracts about 1.2 million visitors annually, the mines feature a breathtaking labyrinthine of chambers, three chapels and an entire cathedral that has been carved out of the rock salt. The microclimate of the mine (with a constant temperature of about 14 degrees Celsius) is said to have a beneficial impact on visitors who suffer from asthma and allergies. The official website with visitor information can be found here: wieliczka-saltmine.com. The Auschwitz Museum and tour present one of the most horrific acts in human history. Visitors to Kraków are faced with the difficult question of whether or not they will make the effort to visit Auschwitz. Located 75 km west of Kraków, it can be reached in several ways. The easiest may be signing up for a tour organized by one of many Kraków-based tour companies. The official website with visitor information can be found here: auschwitz.org/en/museum/news.